PRESS RELEASE. In a bold outpouring of public concern for Southeast Asia’s Mekong River, more than 15,000 people from within the six-country Mekong region and around the world have signed a “Save the Mekong” petition urging governments to abandon plans for hydropower development along the river’s mainstream. The petition – written in seven languages – will be hand-delivered to Thailand’s Prime Minister H.E. Abhisit Vejjajiva on 18 June in Bangkok, and sent to other government leaders within the region. Despite strong government backing for dam building on the Mekong River, over 10,000 people from within the Mekong region have signed the petition addressed to the Prime Ministers of Cambodia, Lao PDR, Thailand and Vietnam urging them to keep the river flowing freely and to pursue less damaging electricity options. The petition is signed by fishers and farmers living along the river’s mainstream and tributaries, as well as by monks, students, city-folk and even some of the region’s well-known celebrities. Another 5,000 people around the world signed the postcards and an online petition. “If the dams happen, where will all of us go to live?” Villager, Stung Treng province, Cambodia. Mekong fisheries provide a critical source of food and income for millions of people along the river. Recent official estimates place the annual value of the river’s wild capture fisheries to be worth up to US$3 billion. Mainstream dams will block the massive fish migrations that count for up to 70% of the river’s commercial fish catch and that ensure regional food security. Experience around the world demonstrates that there is no way to mitigate the fisheries impacts of such large dams. 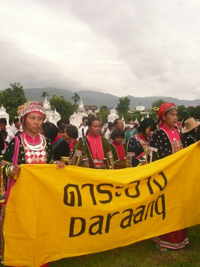 Civil society groups in the Mekong region and internationally have been sounding the alarm about plans to build eleven hydro dams on the Lower Mekong mainstream for many years, in what is often described as an uphill battle.